Any specialist of the service station immediately delivers an unpleasant sentence – CV joint replacement. 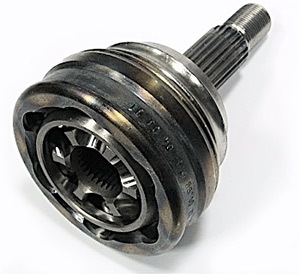 If crackling of the CV joint has started recently and appears only by turning the driving wheel to the extreme edge position or by extreme modes, it is not necessary to buy a new CV joint. Such wear of the CV joint can be restores with the help of special grease — XADO Repairing grease with Revitalizant®. Application of this grease allows restoring the CV joint and provides its operation for the whole service life of the car. To apply the grease, it is necessary to disassemble the CV joint taking previously into notice mutual bracing of the parts. Clean the parts from the old grease and flush them. It is recommended to use a special cleaning agent — XADO Universal industrial flush. Make sure there are no severe damages (chips, deep cracks, craters deeper than 0.1 mm) on the parts and assemble them. Fill the inner space with XADO Repairing grease and reinstall the CV joint. Crackling should completely disappear after 1,500−1,850 miles of run. After 11,000–12,500 miles of run with XADO Repairing grease take off the cap, remove the old grease and clean the inner cavity of the CV joint. Pack it with XADO Grease for constant velocity joints for the whole service lifetime. Install the CV joint and fasten the cap. It is not recommend to start rapidly, because the turning torque by the rapid start is much higher than by running, and by high loads the CV joints get out of service much faster. It is not recommended to rev with the driving wheel being turned to the extreme edge position. When the joint is turned to a high angle relative to the axle, the joint parts are extremely loaded and that results in a quick wear of the CV joint. It is recommended to periodically check the condition of CV joint dust caps: CV joint parts quickly get worn by contamination with sand, dirt and other foreign substances.